Author: Malinowski, Bronislaw Set In . . . 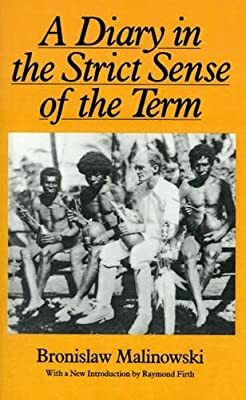 Description: When it was first published (in 1967, posthumously), Bronislaw Malinowski's diary, covering the period of his fieldwork in 1914-1915 and 1917-1918 in New Guinea and the Trobriand Islands, set off a storm of controversy. Many anthropologists felt that the publication of the diary?which Raymond Firth describes as "this revealing, egocentric, obsessional document"?was a profound disservice to the memory of one of the giant figures in the history of anthropology. Almost certainly never intended to be published, Malinowski's diary was intensely personal and brutally honest. He kept it, he said, "as a means of self-analysis." Reviews ranged from "it is to the discredit of all concerned that the diary has now been committed to print" to "fascinating reading." Twenty years have passed, and Raymond Firth suggests that the book has moved over to a more central place in the literature of anthropological reflection. In 1967, Clifford Geertz felt that the "gross, tiresome" diary revealed Malinowski as "a crabbed, self-preoccupied, hypochondriacal narcissist, whose fellow-feeling for the people he lived with was limited in the extreme." But in 1988, Geertz referred to the diary as a "backstage masterpiece of anthropology, our The Double Helix." Similarly in 1987, James Clifford called it "a crucial document for the history of anthropology."